FA Grant Hiskes, Errett Allen, Ken Yager, 1988. Fun route with a mix of hard-to-spot stainless SMC hangers and big light-grey camouflage Fixe hangers. 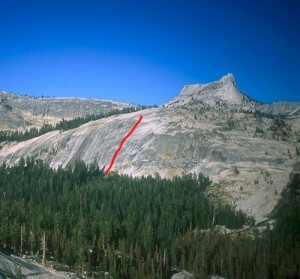 Finish either left or right on easy but runout climbing. Which SuperTopo guidebooks include a topo for Rover Take Over?